You have decided to buy a tent, come to the shop and decided, finally, choice. 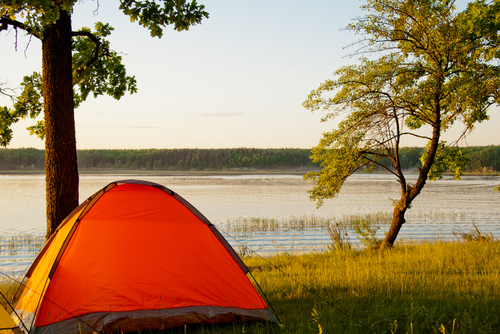 But before you go out in the woods, learn how to properly tent to put. That you need to remember some rules and to consider our recommendations. Inner tent is mostly tied to the awning. Then the frame is in the outside of the tent. This will allow you to install the awning and inner tent. In rainy weather it's especially important. If the tent needs to dry or patched, it can detach from the awning. Tent and without a tent to set up, using it as a large room. The very tent 4 elastic support arc, plug-in special scenes (the scenes are sewn to the tent from the outside). And visor the main entrance is fixed by 2 external racks. We now proceed to the immediate installation of the tent. Lay it so that the tent we looked up outside. Collect arc. When this plug-in connecting elements of the lap at each other until it stops to avoid damaging the frame. Insert arcs in the scenes from the external side of our tent. Metal studs, which are arranged on the adjusting straps, insert the ends of the arcs. Adjust the tension of the awning, checking each of the stands. Fasten the tent from one end to the ground using the pegs, then stretched it along and attach pegs to the ground already at the other end. Now attach the tent to the ground with pegs around the perimeter. Zipper entrances during stringing of the tent should be completely closed. Otherwise lightning then it will be impossible to fasten. Plug-in all remote racks in the grommets the tent door, then tie the two canopy braces. If a strong wind should strengthen the tent additionally stormy stretch marks. When dismantling the tent clearly observe a reverse order of actions: lockable zippers of entrances and ventilation Windows, take out of the ground pegs. Further weaken the tension of the awning and release the ends of the arcs from the mounts. Then forced upward from the scenes of the arc. Notice, that push, not pull. Parse and add the arc. Well, the last step vacated the tent of debris, otrajeniem from the water and pack in the bag. Tent–machine is a tent that has a permanent, very rigid frame of spring steel. Frame covered with top fabric is often nylon (ripstop) with impregnation. Assembled tent looks like a circle with a diameter of 45 cm, Packed in a round case. In order to expand the tent, just enough to shake her from the case. The advantages of this tent is the fact that it is easily decomposed, but the obvious disadvantage is how to collect it back in the case. Imagine that assembled the tent is a triangle with one vertex (top of tent) and the base (the bottom and the floor of the tent), pick up and tuck inside the triangle floor. Now put the tent on its side. Next, take the corner, which is adjacent to the base, (one hand grasp the bottom of the other side) and make a circular motion – you should get a loop. Press it gently to the floor. Thus left and right should still go in the loop. Now each in turn connect to the average loop, and the tent will fold. A (after much agonizing) I wonder how exactly the method is simple, but whatever it was work out at home, to not do this in the field. A real traveler knows how important it is to be able to compactly fold in a backpack. How to collect Chinese tent? Many people, this seems quite difficult. Don't despair, our recommendations will come to your aid. Nothing should interfere with the campaign, location of each item in the backpack should be carefully considered. In this regard, among tourists, a rather popular Chinese tents, they are called in the people "tent-eight" or "an arcuate tent." However, these convenient and simple products are fraught with tricky secret. Not so easy to fold it to the person without experience. So, go ahead. First, correctly take the tent in hand, therein lies the key to success. The hands should be on the side of the tent with a wire frame. Roll up the tent so that both side faces were together. Then turn the eight side face so that from a large oval, she turned in a small circle, which should meet the case of the tent. That's all, the tent is assembled. The most difficult moment of the Assembly is the transformation side of the oval into a circle by twisting. If you own to roll in the right direction the side does not work, get some help. In extreme cases, hold the slippery side of the left leg. In order for such a tent to put it, just get it out of the bag-cover, shake and fold. If the kit included a long metal rod to the roof, insert it into the groove on the roof. On the same principle assembled and disassembled children's play tent. This method of Assembly makes the tent very convenient for storage and transportation. 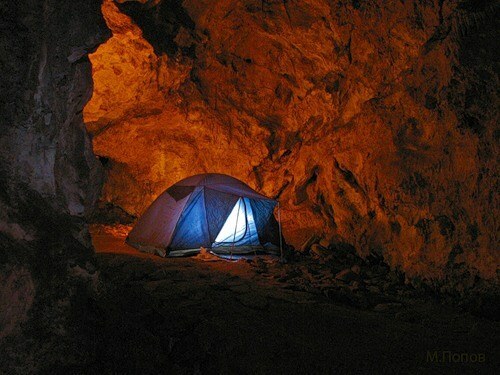 The tents need not only for tourists. They are fishermen and hunters, explorers and scientists-naturalists. 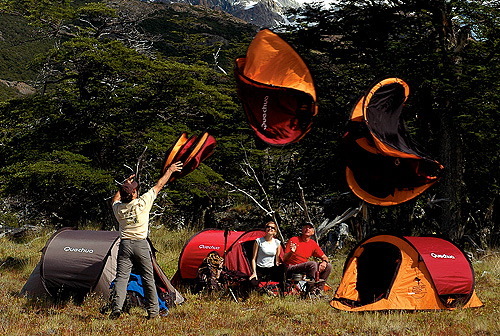 Regular tents, which are mounted on folding frames, have a tight bottom. Tent modern tents are made from waterproof and breathable polyester. The entrance is closed by a zipper. Windows delayed mosquito net. Setting the tent begins with the Assembly of the frame and install the outdoor awning. Then the lower edge of the awning is fixed with pegs under it is filled in the inner part of the tent and fastened in the direction from the end to the exit. The lower edge of the inner tent are stakes, she then stretched stretching the outer tent. Disassembly is performed only after its complete drying and completely the opposite of the Assembly. Ie first understands the inner tent, then outside. The frame is Packed separately and stored in a dry place. In the modern market there is an automatic Chinese tents - tents-eight", which are, once extracted from the case. They are attracted by the low cost and small size. Original cover with a tent are small round bag with a zipper. Released from of bag tent crushes and turns into a taut arc design. However, to assemble this tent represents a certain puzzle. But there is nothing difficult in the Assembly no, if you look. The secret lies in the fact that the side faces have a wire frame that you want to twist. Take the tent in your hands and fold into a triangle, i.e. sides together. The whole awning is put between them. Fold the top triangle towards the bottom, and at its base. Right corner of the tent, turn eight left and left corner to the right, fold them together in a circle. Put the resulting circle in the case. Childrens play tent assembled and disassembled similarly. So they don't take up much space and very convenient for storage. For overnight stay during road trips or travel of the transition to collect in the field tent for some 1-2 minutes is what you need. And conveniently and without much effort. So before you go on an expedition or go on a long trip, armed with information about how going automatic tent. Auto tents are appreciated for functionality, quality, comfort and convenience of design. All you need is to understand the principle of the Assembly, and it is quite simple, allowing automatic tent even in the rain and in the dark easy-going one, even absolutely unprepared person. Build tents in her top. 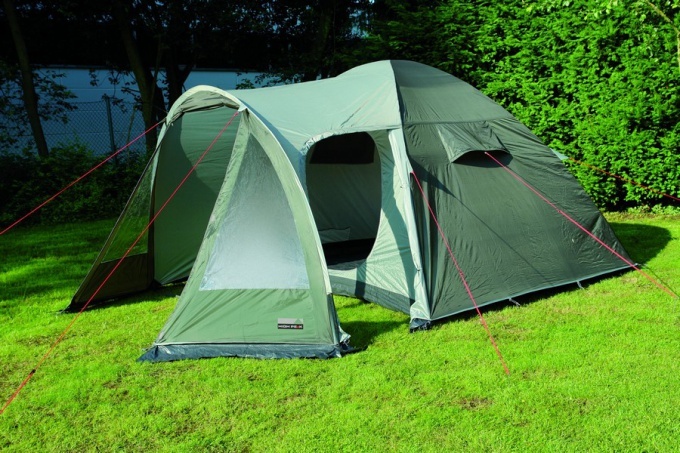 The inner tent, canopy and frame – all together form a coherent whole. Installation of automatic tents is made immediately with all elements. Lift the Central hub. You see that it records all the existing arcs. Now consistently snap on each of them locks with clamps. Next, fasten the zipper of the inner tent floor. That's all – the tent is assembled. Frame to the outer tent attached to the inside. The secret lies in the mechanism of the fixation of arcs and fasteners, which together with a tent is one, besides the inner tent is also fixed to the awning. 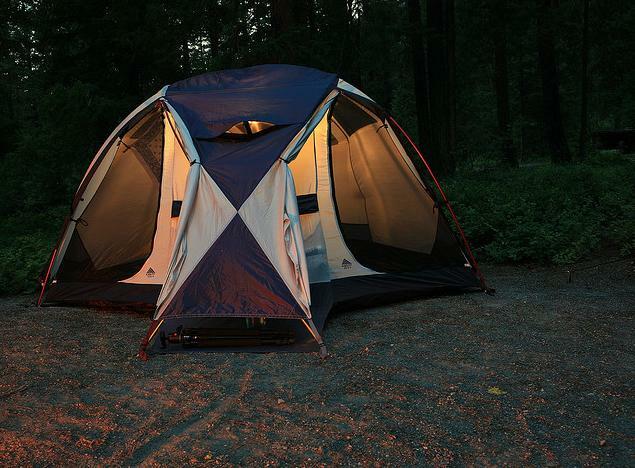 Consequently, assembling the frame, you automatically collect the very tent.